Seven students from around the world graduated from a 10-year intensive program at the YMAA Retreat Center on June 24, 2018. The seven graduates are Jonathan Chang (USA), Javier Rodiguez (USA) and Frank Verhülsdonk (Switzerland), Quentin Lopes (USA), Piper Chan (Canada), Enrico Tomei (Italy) and Michelle Lin (USA). The students trained year-round in the disciplines of Shaolin Long Fist kung fu, Shaolin White Crane kung fu, Yang-style Taijiquan, and Qigong, as well as various weapons, horseback skills, Chinese language, and video production. Graduation - Demo 01 Lion Dance from Barking Rabbit Media on Vimeo. 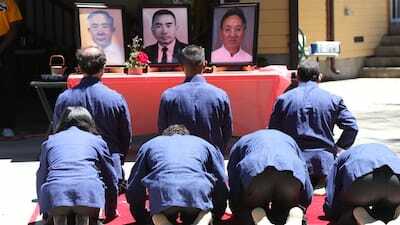 "At the beginning, we had a total of 17 students, but those who lasted were only seven," said Dr. Yang. "These are the seven seeds I have planted in the last ten years. I just hope these seeds will grow and produce more seeds to preserve the arts." Graduation - Demo Highlights from Barking Rabbit Media on Vimeo. 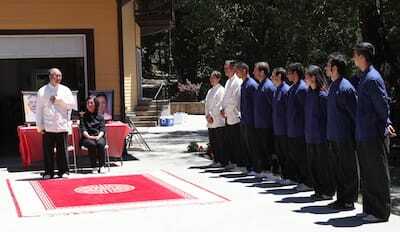 Set in the beautiful mountains of northern California, the ceremony opened with a traditional Lion Dance, followed by individual student demonstrations, the handing out of diplomas, and a formal acceptance of new disciples. In addition to family and friends, attending the ceremony were Mrs. Mei-Ling Yang, Kathy Yang, Nicholas Yang and David Ripianzi, publisher of YMAA Publication Center. "The expression of the art was truly inspiring. It is my opinion that this level of skill is only obtainable by living the training as these YMAA graduates prove," said Ripianzi. Dr. Yang with Mrs. Mei-Ling Yang, Kathy Yang, Nicholas Yang and graduates. Jonathan Chang, a ten-year student, calls Andover, Massachusetts home. "I will continue learning, practicing and teaching. The plan for now is to establish a school on the East Coast while periodically making trips back to the Retreat Center in California and also to the Center in Chile. The Chile Center is currently in planning stages. Some of my best experiences have come from traveling the world with Dr. Yang, seeing a variety of cultures, meeting new people, and making new friends." "I have developed a strong sense of drive and purpose to make the arts relevant for our times," said Javier Rodriguez, hailing from San Antonio, Texas, a nine-year student. "It is easy to stagnate amidst a world struggling with fear and drama. At times, it seems there is no hope. In my eyes there is much opportunity to share the arts and its ability to cultivate connection and communication." "For me graduation day is not a celebration of achievement, but the beginning of a new chapter, and a continuation of refinement," said Frank Verhülsdonk, from Switzerland, a nine-year student. "Life and practice here was a very unique and positive experience. And I gained an appreciation for Dr. Yang as well as for my training partners." "I have decided to help teach Shaolin and taijiquan students at the Retreat Center," said Quentin Lopes, of Mashpee, Massachusetts, a six-year student. "Further down the line, I will pursue a career in martial arts and massage therapy. The best advice I can give is learn how to pace yourself and picture it (life) more as a marathon instead of a sprint." Piper Chan, from Toronto, Ontario, Canada, is a five-year student. He said that after graduation, he plans to spend some quality time with family and friends (and also celebrate with just relaxing, stretching and breathing in the sun.) After that, he will go on to "create my own rhythms and vibrations in the world emphasizing that 'focus is the key.'" "The purpose of the Center is to preserve and pass down traditional Chinese martial arts," said Michelle Lin, originating from Andover, Massachusetts, a graduate of Tufts University and a five-year student. She was also discovered online and cast in the film "Assassins Creed. "I will return to the Retreat Center for the fall 2018 semester. The arts are incredibly deep and I've only begun to scratch the surface. Afterwards, I will move back to Massachusetts and train, teach, and make periodic visits to the center to update my training." Enrico Tomeio, a five-year student from Italy, will return to his hometown to improve and grow the YMAA Apulia school. "I want to make YMAA Italy big in the international YMAA community. I plan on opening more schools in Italy through a rigorous media campaign. From the training program point of view, I want to promote the art following the traditional principles that I learned under Dr. Yang's tutelage at the Center over the past five years. I want to correct the erroneous idea that traditional Chinese martial arts are just good for health and fitness. With my 19 years of training, I'll strive to trace back the training methodologies that taijiquan practitioners used to follow to make their art effective in combat." The YMAA Retreat Center is a non-profit organization dedicated to preserving the arts since 2005. The center is located in the mountains of Humboldt County, California and established by world renowned author and teacher, Dr. Yang, Jwing-Ming. Preserving the arts is the focus of Dr. Yang's work throughout the past 50 + years. Graduation - Speech by Dr. Yang from Barking Rabbit Media on Vimeo. The Success of the 10-Year Program. "Almost all graduates have reached the expected quality of learning and training. I hope all graduates will spend the rest of their lifetime to learn, practice, teach, and spread the knowledge continuously." Today's Classical Martial Arts. 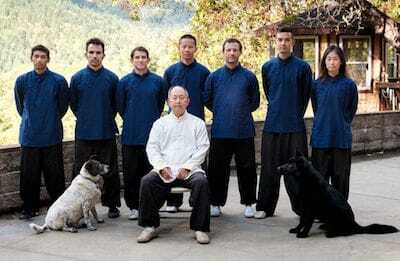 "Chinese martial arts have been commonly used for self-discipline and spiritual developments. These were the reasons that the best martial arts were created and preserved in Chinese Buddhist and Daoist monasteries. In order to develop the spirit to a higher level, one must know how and be able to conquer oneself. Through this self-conquering and challenge, the arts can reach higher and the spirit can evolve further. "There is too much material attraction in life and the spiritual side of development has been widely ignored. Even though most people have a high level of material enjoyment, they are not happy. That's because the meaning of life is missing. Without spiritual development, half of your life is empty. Martial arts as well as many other classical arts can provide the path to understanding and the meaning of life." "Almost all Chinese martial arts training were defensive instead of offensive. Traditionally, half of the training was self-spiritual cultivation. Unfortunately, many martial artists focus in the fighting side and ignore the importance of spiritual development. This has led the general public to a wrong idea that martial arts are violent and cruel, as seen from all martial arts movies. Most of the time, violence was the main focus and the peace and harmonization of spiritual cultivation were neglected. "I hope all martial artists re-evaluate the value of martial training and again bring back the peaceful side of training." Future Plans for the Center. "With the help of supporters and funding from the Ku Foundation" said Dr. Yang, "we have recruited seven to eight students for the three-year program which will be completed in June 2021."